Sharon's Tatted Lace: Look ma, I'm going to be on TV. Look ma, I'm going to be on TV. Well it looks like the CBC - Living in Toronto episode about tatting will air Wednesday January 9th at 1:00 PM. If you aren't able to get CBC you can view it on the web site. This is the part where I cross my fingers and hope I don't look like a total idiot on national TV. You know those times in your life when in retrospect you do a lot of thinking about woulda, coulda, shoulda? That's how I've been feeling about this show lately. I keep hoping that their editing department makes me look smarter than I am. 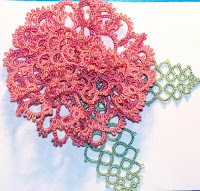 The flower pictured here is from my book Transitions in Tatting from Flat to Floral. It measures about 2.5 inches across and it was tatted in Opera size 20. The construction is such that it doesn't flatten out like the carnations I did for my wedding veil. How exciting! I hope I can figure out how to watch it! Ohhh how exciting. I will watch for it! I am sure you will look like a true professional!